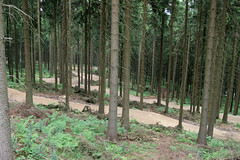 Winterberg was a big project. We had been in discussions for months and site visits had been made. The time had come for AJ Watkins, our top park builder, responsible for many of the UK’s mountainboard centres, and Tom Kirkman, former World Freestyle Champion, to head out to Germany and start the building work. Winterberg is based near Dortmund in Germany and operates as a ski and snowboard resort in the winter and run an excellent bike park in the summer. They wanted to make more out of their park in the summer, and mountainboarding was a perfect match. They cleared some trees to make some space for an epic boarder cross track. After a week in a digger, and a whole lot of tracking in with a quad, raking and stone picking the track was complete. This track is about a kilometre in length and very fast. Very conveniently it ends right next to the lift access. Very few UK centres enjoy lifts like this. Tom Kirkman was there to test it out and make sure the track was running well. On top of this a beginners area and a freestyle area were built. A lot of the park is designed so it can be used in winter too. Hence the freestyle area is raised quite high, in order to cater for a nice layer of snow. 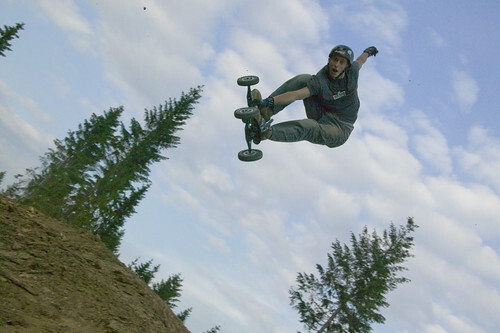 Without a doubt Winterberg is now one of the best mountainboard centres in the world. 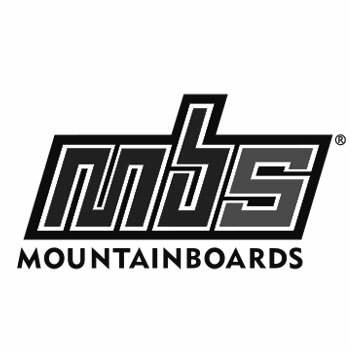 Tom and AJ trained up a group of locals into instructors, and we sent them a full fleet of MBS mountain boards. Very soon the park will open to the public and we know people will travel from all over Europe to ride there. See more photos of AJ and Tom building Winterberg mountainboard park. This entry was posted in Centres. Bookmark the permalink.